This article will show you how to export tracks, routes and waypoints from the app by email, AirDrop and iTunes. Note: You can export photos associated with your tracks as a KML file. There is a 20 photo limit per export. Tap the Action Icon in the top right corner, then select "Export"
You can also choose to export all tracks, waypoints, or routes at one time by tapping the Action Icon from the top of a saved list. Then select "Export Tracks"
Follow the instructions in the Turn on AirDrop portion of this Apple support document for both the sending and receiving devices. 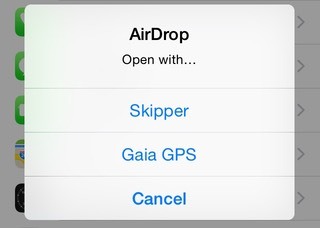 Once both iOS devices have AirDrop enabled, navigate to the Saved data you want to AirDrop and select Export. Select your recipient from the AirDrop field. If their device doesn't show in the list, try enabling AirDrop from both devices again. You will be prompted to select a program for the drop. Once Gaia GPS is selected, a popup will indicate the import succeeded. Every time you import a file into Gaia GPS, a new folder is created. The default name of the AirDropped Folder is track.gpx, the track and waypoint names are attached to the contents. Follow the instructions here to rename the file. Note: Follow these steps for iTunes export to a PC. Select export Zip from the export options. Scroll down to the File Sharing section, select Gaia GPS from the Apps list, and then find the Export file to drag and drop onto your desktop. Hi Nathan, i'm another SAR/Mt Rescue guy that really has a need to be able to transfer files from mission operations when "off-line". Most members use Gaia IS & Androids in the field. Any help at being able to transfer files to PC would be appreciated by ALLOT of folks! Thanks for this helpful information. Am I right that at present there is no way to transfer a GAIA gpx file from an iphone to a PC laptop via USB cable (even if the PC has iTunes)? The reason I ask is because we often use GAIA "offline" (ie, in areas with no cell or wifi connection), record a track, and then we need to transfer the GPX files to a PC laptop at base. 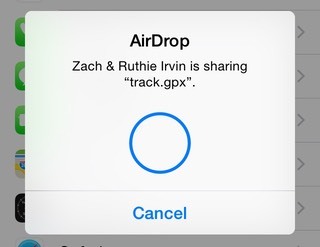 (I don't believe you can use AirDrop either to connect an iphone and a PC - or can you?). If you know of any way to share the Gaia gpx file with the PC in the absence of cell or internet connectivity, please let me know. Currently, the “Export All” option is just available in the iOS version of the app. Sorry about that. For bulk waypoint exports, I recommend syncing your device with gaiagps.com, file all of your waypoints into a folder, and then export the folder from the website. Sorry for the confusion, here is the link to the Android article for exporting data: Export Tracks and Waypoints via Email, Dropbox, etc. Yes, the option to transfer data via a USB cable through iTunes and AirDrop are just available with a Mac, sorry about that. We have a know issue open for not being able to transfer via ion a PC and I apologize for the inconvenience. It sounds like you are accessing your data through gaiagps.com on your iPad instead of the app. Here's a screenshot of exporting from the iPad version of Gaia GPS. When viewing your data on gaiagps.com, you can export it by following the steps in this article: Export data from gaiagps.com. On my iPad My Gaia page is headed ‘my tracks’ and does not display an action icon, hence there is no option to export the track I have saved and wish to send to google earth. On the iPhone I can do this and did send a track to ge which is now in my saved places. It is a mystery why this does not appear when I access ge on the iPad. Thanks for posting - it looks like Nate got back to you via email for steps about this. for KML files or gpxeditor.co.uk for GPX files. You can also view all of your data on gaiagps.com by syncing your account. Follow these steps for the iOS app. I succcessfully exported my saved trip route, emailed it to myself and then downloaded it to a file on my computer, but now I can't open it. My PC laptop is asking for a program to choose to open it. I tried free opener and it did not work. Any advice? @Nathan Thanks for posting Android instructions for exporting gps points. However, there doesn't appear to be an option to export all way points at once from a saved list like there is in the iPhone directions. The action menu on my saved list only lists "hide filed items." No option to download the points in bulk. Do I have to download each way point individually if I'm using android? This only contains instructions for iOS devices. Since this app is available for android devices there should be an android "how to" made available as well.